The Fort Worth Cultural District draws approximately 4.5 million visitors a year, over twice the attendance of all Dallas Cowboys, Dallas Stars and Dallas Mavericks games combined. Welcome to Museum Place, an 11-acre, mixed-use development under construction in the world-renowned Fort Worth Cultural District. The $150 million project will include 165,000 SF of ground level retail, 110,000 SF of Class A office above retail and 500+ residential units above retail. Under construction by year-end 2006, it will be built in phases with a target completion date in 2010. 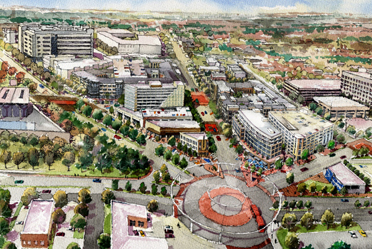 Museum Place will be a pedestrian-friendly, moderately intense mixed-use development that includes public plazas, open spaces, wide tree-line sidewalks and abundant on-street parking. The Project is being designed to accommodate light rail public transit with a transit stop one block adjacent to a large public plaza. With multiple restaurants, a boutique hotel and a small cinema, Museum Place will generate a lively street scene, enhanced by residences above the retail and restaurant level, complete with balconies and terraces that make the residents a part of the street’s life. Museum Place is designed with structured parking within each block that will more than meet the Project’s needs and will allow visitors and residents the opportunity to park once and complete their shopping, dining and entertainment, without moving their car. Museum Place Development Group, Ltd., developer of the project, is an affiliate of JaGee Holdings, LLP, a Fort Worth based company that owns and manages more than one million square feet of retail and industrial real estate. Museum Place Development has teamed with Tony Landrum of TLC Urban, developer of The Tower and other high quality projects, to create a masterpiece of urban living in Fort Worth’s most desirable location. © 2006 JaGee Holdings, LLP - All rights reserved.